Please Note our Replays will now only be available for 7 days - after which they will expire - to support our Speakers, our platform and enable our listeners to exchange energy so that they can jump start and pick up speed with the energy of give and receive. Thereby everyone is supported in community and everyone has the chance to unlock their propsperity by asking that what they give in the way of energy exchange and money comes back to them multiplied x10, x100, x1000 in monetary value and blessings or something even better! This came to us, as a download on a call with Vandana on October 9th - as we write in our New Book of Life. The Value of our call recordings came in as $17.77 USD and we are offering you our calls for $8.88 USD. Yes, We are now offering you the ability to purchase individual calls recordings from Transformation To Joy of your favorite calls - as many of you have asked for in the past. To purchase simply click on the button below. Do make sure you press the Return to Merchant button after making your purchase. Also do email us at Support with details of the Name of the Speaker and the Date of the call you have purchased so we send you the access details for your call recording. This was another powerful, high energy call with Vandana Atara Aura. A powerful call you will want to listen to and share with your friends and family. On this 3 hrs, 11 mins call also did a long and an amazing Process, that you will want to listen to over and over again. This call will expire on October 17th and will be available for purchase. Rosemary, "This was your best work yet, I have to say. It was amazing! "She went on to decsribe how now is the time to shift into the new and let go of the old contracts. What Vandana had to share deeply resonated with Rosemary. Maria said, "Wow! Amazing Activation so long. I am so impressed! Maria dropped her pain from 6/7 to zero.almost gone as Vandana worked on her issue. Pamela said, " That was an amazing process, truly powerful. I literally was pulled back in my chair!" Carolyn wrote in to say, "Hello Ladies, I'm really enjoying your call. Can you please tell me, is there something I can heal and shift from my maternal lineage about poverty and victimhood? And if not my mother's line, then my father's? Thank you so much, Many blessings! " Josef wrote in three times! "Class # 1: Learn How To Access & Open Your Own Soul Records Connect With Your Personal Guides, Guardians, & Akashic Record Keepers still has something to do with acashic records doesnt it ?" "yes, the part of rewriting is also what i got then, as i said didnt take it serious, was walking with my cat and it was like some little child was talking to me, some child babbeling, where the mind thinks jaja its ok go to bed now..."
Hsien wrote in to ask a question, "Hi, I'm very interested and would like to invest in package C but I'm wondering if I do not have any successful experiences with either past life regression or hypnosis in general. Would you think it's not likely to for me to become a Certified Soul Records Reader? What would you suggest if I go through the program and is unsuccessful? Also, will your program help with chronic pain?" He was happy with Vandana's reply but also wrote to get confirmation that Vandana will provide support and guidance as needed - which Vandana reassured Hsien that she will an that they is exactly what she looks for when she joins similar programs. Vandana brings to Transformation To Joy her Newly created Accelerated Abundance Program To Help You Clear Lack, Scarcity & Limitation on a cellular level for you, our amazing listeners. You Can Inscribe Your Name In A New Book Of Life To Flow, Flourish & Be Free Of Old Stories & Records With Ease & Grace! You Are Way More Powerful & Magical Than You Think Or Have Ever Been Told! Vandana changed her own soul destiny & now she shares how to change yours! If You’re Tired Of Feeling Stuck In Survival Mode, You Can Choose To Thrive On The New Earth Wealth Vibration! Unlock, Cancel & Clear Ancestral Shame, Family Karma & Survival Trauma From All Space, Dimensions & Timelines For You & Your Entire Lineage. Vandana Reminds You That You Came Here To Thrive and Not Just To Survive! So do Listen to her Replay before the Replay expires on October 14th and do check out her Special Offer here. Step into your Joy and Transform Your Life from the Inside Out! Sign up here and we will immediately deliver your FREE Activation Kit to your in-box! Yes! Send me Instant Access to my FREE Gifts! 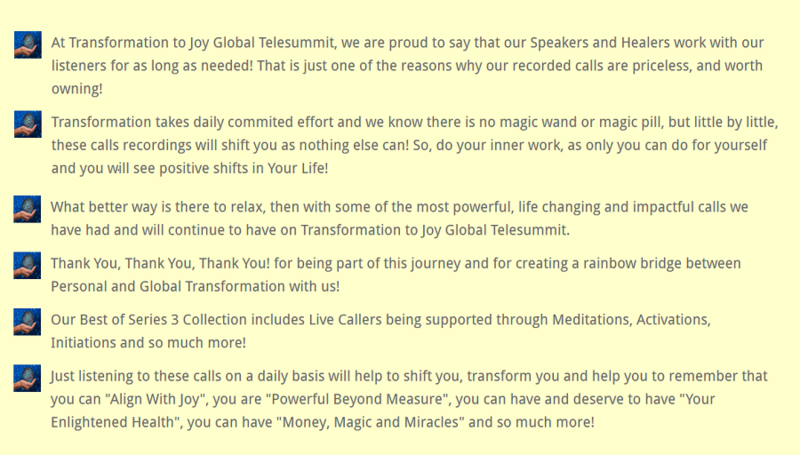 Exclusively from Transformation ToJoy Global Telesummit - Limited Time Offer - Huge Value!!! - Yours to Own & Download!